The first order of business today was to drive to a small Minnesota town before shooting started at 9 a.m. so Jim could borrow his grandfather's gun from a cousin. It's a very early 16 gauge Browning semi-automatic with a solid rib - like an artillery gun the barrel actually retracts when fired. Enlarge the picture on the right - you can see the latest communication gizmo sticking out of Jim's ear ... er wait ... I guess that's a water tower. 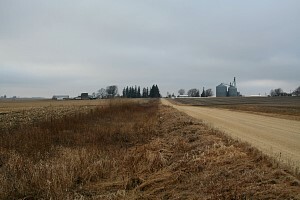 Remember Tom's rule of finding pheasants - quite a few live within site of small town water towers. It's been a dismal hunting season for us late-season hunters. No snow. The temperature has been unseasonably warm - 30's and 40's instead of 10's and 20's. 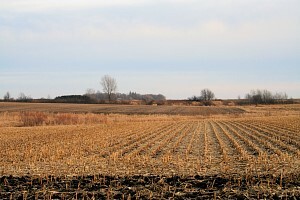 Consequently the birds have not bunched up, and are still scattered along the bare fields picking up waste grain. 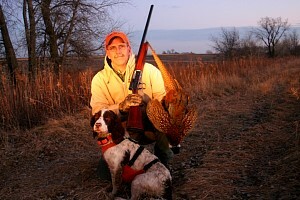 When we see pheasants we see equal numbers of hens and roosters, so the hunting pressure has been light. 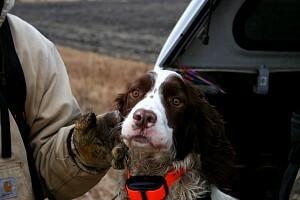 Here at a place we call PM I drop Jim and his young dog Casey (K.C.? Kaysee? Kyzhee?) off. They will hunt along this fence line while I drive around to the farmhouse and go in there. The people who live here recognize us from previous years and they always let us hunt. Our extended group of five hunters has given almost all the areas we hunt a name. Our first hunt was Shakers ditch (TNHH?). 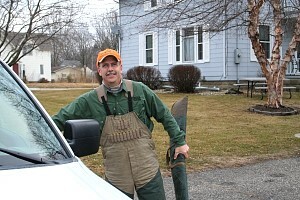 I heard a rooster in the ditch right in front of me and flushed him - my gun wouldn't fire. Jim has worked as the gun manger in a sporting goods store, and he couldn't make the damn thing work, so having Grandpa's gun along, eventually I just used his other gun. 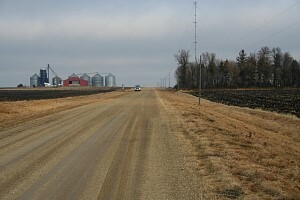 I will turn left, drive down this road to the farm on the left, park the truck, then walk around back to meet up with Jim. This classic two-front campaign should drive birds ahead of us. 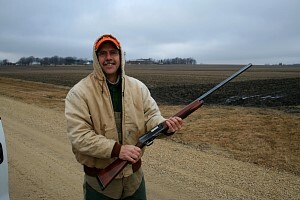 We will meet up where pheasants usually flush, thus bringing maximum firepower to bear when we meet up with our quarry. We are borrowing this tactic from "The Art of War" by Sun Tzu. We flushed five roosters when we met up. I fired at the first bird that rose, then my gun jammed. We have continued our walk around the farm and now are in the S.E. corner of PM. Casey worked and flushed a hen very close to Jim, but we didn't see hide nor hair of the two or three roosters who flew down this way. 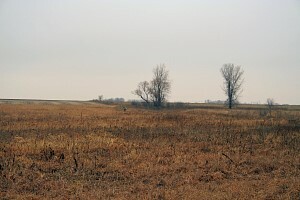 Most likely they set their wings and glided to the next farm, the trees of which you can see in the distance. We finished the hunt and are returning to the truck along the road. We are going off to hunt Hamilton. Here is a good shot of Jim and his dog. I hunt by myself quite often and do pretty well. 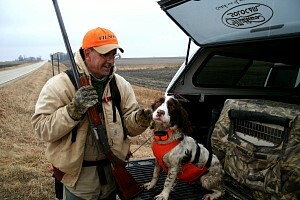 But there is nothing like hunting behind a good dog, and Jim has a very good dog in Casey. He stays close and at an early age is a great hunter. You just have to watch the dog to know when a pheasant is nearby. Jim has a belly vest on the dog so A). Someone doesn't shoot the dog on the ground and B). Sharp thorns or branches or reeds don't jam into Casey's chest. We don't really shoot anything on the ground, the most call for that is a wounded yet running bird. This is "The Pines" or more recently called "Kept Keys". We hunt it in a pincer movement, I got dropped off on the road and walk a swale and tree line then turn right and meet up with Jim. We have seen pheasants here several times already this year, and I believe Jim has shot a couple here, but no birds today. This place has a pond in it and goes back to the abandoned Chicago Great Western Railway roadbed. Good cover with food nearly - Casey flushed a couple of hens. Knowing the name of this abandoned railroad has been bugging me for some years. Jim called his wife on my cell phone and got the number for his dad living in Arkansas. Jim called him and asked about the railroad - not only did his dad know the name, Jim's dad WORKED on this railroad. The Chicago Great Western Railway was a Class I railroad that linked Chicago, Minneapolis, Omaha, and Kansas City. It was founded by Alpheus Beede Stickney in 1885 as a regional line between St. Paul and the Iowa state line called the Minnesota & Northwestern Railroad. Through mergers and new construction, the railroad, named Chicago Great Western after 1909, quickly became a multi-state carrier. One of the last Class I railroads to be built, it competed against several other more well-established railroads in the same territory, and developed a corporate culture of innovation and efficiency to survive. Nicknamed the Corn Belt Route because of its operating area in the Midwestern United States, the railroad was sometimes called the Lucky Strike Road, due to the similarity in design between the herald of the CGW and the logo used for Lucky Strike cigarettes. It was merged with the Chicago and North Western Railway (CNW) in 1968, which abandoned most of the CGW's trackage. 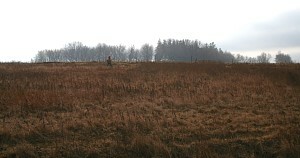 The last hunt of the day was the swale between Beagle ditch and the abandoned tracks by Guilderhuse. Jim came along Beagle ditch then cut over east along a grassy swale while I walked out along the Chicago Great Western Railway roadbed, turned west, and met up with him in the swale. Casey flushed a rooster and as it flew by Jim he shot it. Here it is, I turned the truck headlights on to get a better picture. Before I got there Jim missed a second rooster. Jim is hitting about 90% I would say, I am only pushing 60%. For all the effort we put in busting through cover, it's dumb not to have an average like Jim's. I had one close flush today that I missed: Jim hit him with a long shot but the rooster struggled to open ground and is in South Dakota by now. Here is Jim, Casey, and Grandpa's gun.